The rent at The Elms at Oakton Apartments ranges from $2,019 for a one bedroom to a $2,367 two bedroom. Apartments in this building are about 9% more expensive than the Oakton average. This is a pet-friendly apartment. This apartment is in Oakton. Nearby parks include Oak Marr Park, Tattersall Park and Cobbdale Park. 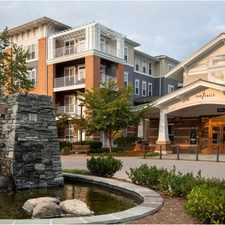 The Elms at Oakton Apartments has a Walk Score of 25 out of 100. This location is a Car-Dependent neighborhood so most errands require a car. At The Elms, you’ll find the space and location you desire and we provide the comfort you deserve in a beautiful setting. The Elms at Oakton is across the street from the Oak Marr Recreation Center, offering an Olympic-sized indoor pool, health and fitness classes and a driving range with par 3 golf courses. The Elms at Oakton is conveniently located near Tysons Corner, Fair Oaks Mall, the Vienna Metro, I-66 and the Capital Beltway. In every way, you’ll find the complete lifestyle you deserve and the balance you’ve been looking for. An Award winning team of professionals consistently delivers a warm and genuine approach to caring for our residents. The Elms teams is not just committed to providing an exceptional customer experience, we work to build a sense of community. Explore how far you can travel by car, bus, bike and foot from The Elms at Oakton Apartments. The Elms at Oakton Apartments has some transit which means a few nearby public transportation options. View all Oakton apartments on a map. Search for homes in Oakton or find a Oakton real estate agent who knows walkable neighborhoods. Links will open on our partner site Redfin.com. The Elms at Oakton Apartments is in the city of Oakton, VA. Oakton has an average Walk Score of 29 and has 34,166 residents.